Pilots at RAF Wyton have turned the clock back a century to the dawn of flying at the station – by building a new grass runway. The inaugural flight from the new runway was made to mark the 100th anniversary of aviation which began at the then Wyton Aerodrome in the middle of the First World War. Wing Commander Andy March, who made the last flight from the station’s paved runway in March this year, carried out the first take-off on the grass strip. Wing Commander March, an RAF aerosystems engineering officer, said: “In March this year I had the proud honour to be the last pilot to take off from RAF Wyton’s paved runway, one that has witnessed some of the most impressive and iconic aircraft ever to have worn the RAF roundel. 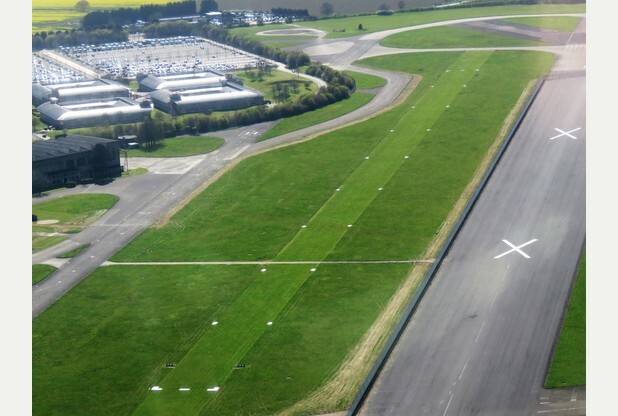 Wyton’s paved runways were formally decommissioned in March meaning they could not be used for flying. 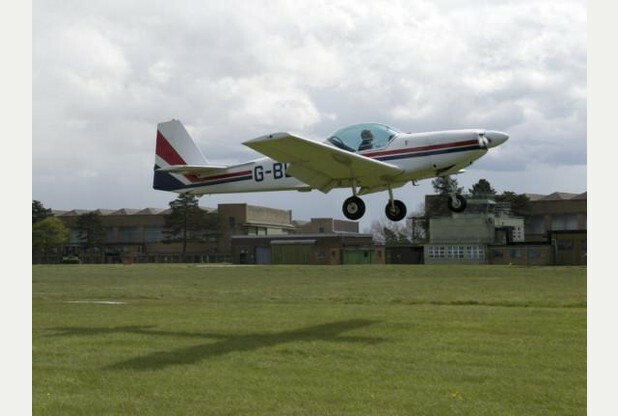 But the Pathfinder Flying Club, which had been using them, already had plans in hand to build a grass runway and the bulk of the ground work was carried out last year. Roy Twigg, a retired RAF engineering officer who is now the club’s chief engineer, said the runway was self-funded but that they had been given a great deal of support by the Wyton-based 42 Engineer Regiment (Geographic) which surveyed the site and Rebecca Rayner, from Glebe Farm, who provided machinery hire, soil and grass seed. He said that in addition to levelling the site, a further 60 tonnes of top soil was added, along with 40 kilos of grass seed. The club also had to draw up new procedures before the grass strip became operational. 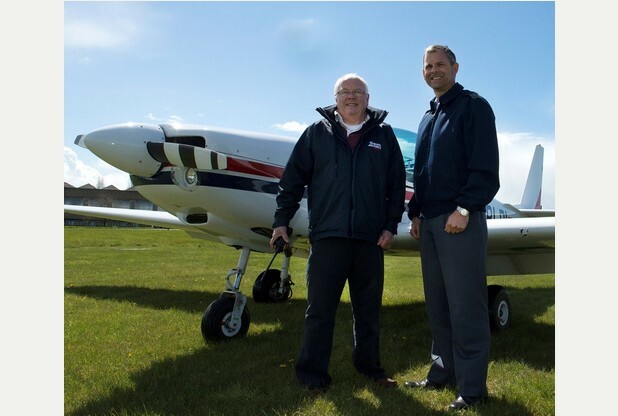 Pathfinder Flying Club provides flying training for regular and reserve service personnel and civil service staff employed by the RAF, together with a small number of civilian members. It is named after the Pathfinder Force which operated from RAF Wyton during the Second World War. The first flight at Wyton Aerodrome was by a Royal Flying Corps Nieuport 12 on April 19 1916 and the site became RAF Wyton in 1918 on the formation of the Royal Air Force. Military flying ended just short of the centenary. The first RAF operations of the Second World War were flown from RAF Wyton and Canberras operated from the station for many years. Going Egg Free as well as Gluten and Wheat Free? When Glebe Farm does the London, Liverpool and Glasgow Allergy and Free From shows we meet a number of people with multiple allergies in their diet, including egg free as well as wheat and gluten free. We would usually make a special cake with the Glebe Farm Gluten Free Chocolate Cake Mix and add Vitalite margarine and 2 bananas. Customers are delighted that they have something to eat as often manufacturers do not consider excluding eggs in their recipes. Eggs are one of the most common food allergens. Sometimes it is a reaction to the proteins in egg whites or and sometimes it is the yolks. People with an allergy to chicken eggs may also be allergic to other types of eggs, such as goose, duck, turkey or quail. For people with a mild allergic reactions to eggs, symptoms can be skin rashes, wheezing or difficulties in breathing, runny nose, sneezing, red or watery eyes, stomach pain, nausea, vomiting, diarrhoea and or inflammation. More serious allergic reaction are anaphylaxis, a life-threatening condition that impairs breathing and can send the body into shock. Eggs are used a lot in gluten free cookery as eggs lighten cakes, colour pastries, and add protein to bread. At first glance, it may look to be a challenge to cook gluten and egg free. However there are plenty of ways to replace eggs when you are baking. Check out the Glebe Farm Recipe Section for Egg Free recipes. Gluten & Egg Free Muffins RecipeCertain food manufacturers produce egg substitutes powdered mixes, which when added to liquid, try and replicate the same cooking properties as egg. Organ No Egg is recommended and a good second best is Allergycare Whole Egg Replacer. The disadvantage is that they can leave the food dry particularly when it is gluten and wheat free too. Natural alternatives are replacing egg with mashed ripe banana (one banana replaces one egg) or apple sauce (as in pork and apple sauce) found in jars in supermarkets. One can use chia seeds; add one tablespoon of chia seeds into 3 tablespoons of water, then soak and leave to create a gooey gel. Alternatively use one tablespoon of ground flax seed (linseed) to 3 tablespoons of water. Another tried and tested idea vegans use is to use one teaspoon of bicarbonate of soda to one tablespoon of vinegar to re-create and beaten egg look. The newest breakthrough is to obtain egg free egg whites for meringues and macaroons is to drain the juice of a tin of chickpeas and whisk to resemble peaky egg white. Use 3 tablespoons of chickpea juice to substitute one egg white. So there are lots of ways to replace eggs when you are baking. So don’t just say ‘I can’t’… go on and try one of the above alternatives! Glebe Farm’s Wellington Bomber and Mosquito WWII planes. There has been a lot of publicity recently about WWII aircraft being dug up in the local area. A few years ago part of a Mosquito under-carriage was pulled up by a tractor pulling a farm implement. Nobody really new what it was but it was suggested that it should be taken to the Pathfinder Museum at RAF Wyton. Then all went quiet…..
Marc Marshall, from Glebe Farm, was keen to try his new metal detector. The crops were still standing in July so he started digging at gaps within the crops. Without realising it, these sparsely cropped areas, no bigger than a size of a small car, were dotted with sand patches within the soil. This was evidence that oil seepage had been found as the RAF usually would have filled the area with sand after a crash. This aircraft only had one successful mission and took off from Warboys airfield on the 27th August 1942 with that nights target being Kassel. The aircraft was attacked by a night fighter while over Hamm/Munster but after retaliating with machine gun fire, the fighter retreated and the Wellington returned with minor flak damage. The Wellington’s second fateful mission was to target Saarbrucken on the night of 1st September 1942, unfortunately just after takeoff the aircraft crashed into land at Glebe Farm, bursting into flames and killing three of the crew who are buried locally at Houghton / Wyton churchyard. Although the majority of the wreckage was removed at the time of the crash many parts have been found in the area with a metal detector such as the geodetic construction tubing (air frame), parts of a bomb sight, oxygen regulator, radio parts, engine parts, electrical connections, remains of .303 cartridges and many fragments of aluminium, some of which formed into ingots from the heat of the fire. The second crash site on Glebe Farm is believed to be a De Havilland Mosquito as many parts have been found that relate to this type of aircraft but the investigation is still ongoing and currently being researched. Parts found include parachute buckles, cockpit gauge, fragments of wood, Perspex and many fragments of engine casing. Marc’s other hobby, other than metal detecting, is brewing beer. Night Mission and Wellington Bomber Porter have been developed and brewed in Memory of Heroes. The Pathfinder Memorial Weekend was held on 15-16th August. It is an annual event whereby Pathfinders war veterans, who fought in World War II are invited to RAF Wyton. We were lucky enough to have 13 Pathfinders join us this year. The day entailed a reception at the Sergeant’s Mess to reunite families, then a church service, dinner and a fly past. Chris Thurling at the RAF Wyton invited us to set up a stand to show our Wellington and Mosquito findings that had crashed into the fields at Glebe Farm. I was lucky enough meet to the St Ives Deputy Mayor. We were invited to the St George’s chapel service where the RAF Wyton Brass Band lead a moving service. After the dinner we were lucky enough to have a Blenheim plane flypass and then it was time for a few beers! A fine day and the weather was on our side too!